WASHINGTON (CNN) -- One of several proposals to overhaul the U.S. health care system passed a Senate committee Wednesday, with its ailing chairman praising the $600 billion plan as a step toward his longtime goals. Committee chairman Sen. Edward Kennedy in a statement praised the bill. He voted by proxy. The 13-10 vote in the Senate Health, Education, Labor and Pensions Committee split along party lines, with its top Republican arguing it costs too much and would ration care to Americans. But Sen. Edward Kennedy, its chairman, said, "We have done the hard work that the American people sent us here to do." "We know, however, that our work is not over -- far from it," Kennedy said in a written statement. The senator is battling cancer and voted by proxy. "As we move from our committee room to the Senate floor, we must continue the search for solutions that unite us, so that the great promise of quality affordable health care for all can be fulfilled," Kennedy said in the statement. Health care has long been one of the Massachusetts Democrat's pet issues. 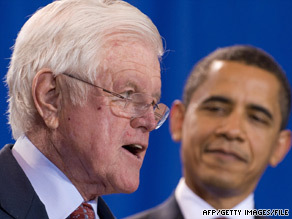 Connecticut Sen. Chris Dodd, who led the committee in Kennedy's absence, said the bill is the first of several proposals "to grapple with the issue that has defied resolution through seven presidents and many Congresses since the 1940s." It is also one of President Obama's top legislative goals, and the bill that cleared Kennedy's committee closely tracks the framework Obama has outlined for a health care bill. It includes a government-run health insurance program that would compete with private insurers, requires companies with more than 25 employees to provide medical coverage for their workers and sets up an "exchange" that would let people choose among a variety of insurance options. The nonpartisan Congressional Budget Office reported it would cost $615 billion over 10 years, far less than estimates for other legislation. But the estimate did not include the cost of a proposed expansion of the federally funded Medicaid system for low-income families, which could add several hundred billion dollars to the overall tab. Sen. Mike Enzi, the health committee's top Republican, called the measure "a prescription for failure." He said the real cost would be about $1 trillion, and the measure would drive up cost and ration health care on lines similar to Britain. Under the British health care system, "The older you are, the longer you have to wait to see a doctor, the longer you have to wait for tests, the longer you have to wait to get treatment," said Enzi, of Wyoming. "The people die. That's not the system we'll buy in America." Obama and top congressional Democrats met Monday to discuss how to pay for a sweeping health care overhaul. Meanwhile, the Senate Finance Committee is working on another health care bill, and Democratic leaders in the House of Representatives released their own proposal Tuesday. In a Rose Garden appearance after Wednesday's vote, Obama said the proposals "will offer stability and security to Americans who have coverage today, and affordable options for Americans who don't." "This progress should make us hopeful, but it shouldn't make us complacent," he said. "It should instead provide the urgency for both the House and the Senate to finish their critical work on health reform before the August recess."